When buying a rental property, a rent roll is the most critical document required while evaluating the income of the property correctly. 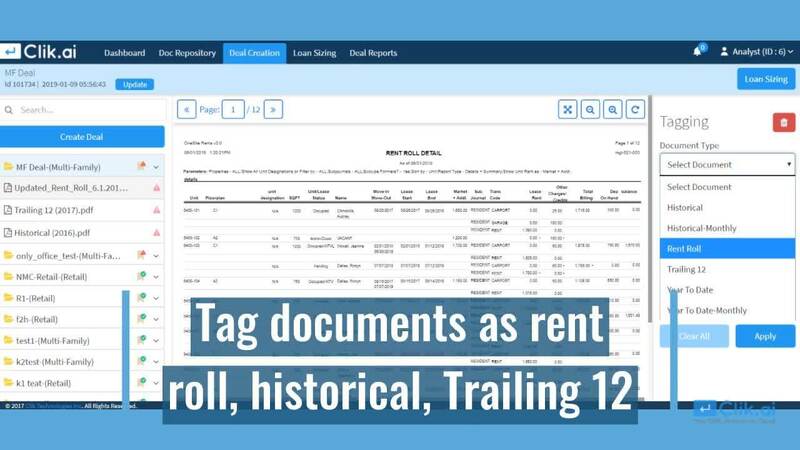 Extracting data from financial statements and rent roll is a frustrating experience for a real estate analysts as it's purely non-value add (data-entry) work. Unfortunately, till date, there are not many effective ways you can do this. One of the most effective tactics is purchasing pro license for desktop software like Adobe Acrobat and other PDF readers. Although they do a good job at OCR but after extracting the data the analyst still needs to put that in the right format. Typically there would be few hours spent. While there are no sure shot ways to handle documents correctly but there are few automated solutions available. Clik.ai has built an advanced tool for users to extract information into a structured format from PDF, Scan documents, Excel files. Simple 4-step process can help save few hours so that the real estate teams can spend more time doing value-add work i.e analysis and "not" data-entry.